Mirro Company has invested a lot of effort to create and develop perfect cookers and canners that meets all the requirements of home cooking. As a result of many years of experience, Mirro Pressure Cooker represents a solution for fast, economical and safe pressure-cooking. Using steam, pressure cookers cook many types of food more quickly than other dry cooking methods. As a result, steam can be used to cook anything from delicate or crisp vegetables to large pieces of fresh or frozen meat. Mirro’s pressure cooker is a way of creating healthful meals as well as to meet the needs of a modern kitchen as well. Besides its versatility in preparing different foods, this model pressure cooker offers cooking without losing of healthy nutrients normally lost to air, water, and heat cooking methods used in regular pots. Now we’ll take a look at Mirro Polished Aluminum Pressure Cooker/Canner, this product is the best pressure cooker and canner of Mirro Company. Check out This Mirro Pressure Cooker & Canner at Amazon! 3 Pressure Level Settings: this Mirro pressure canner and cooker has numerous advantages such as 3 pressure level settings. The adjustable pressure offers cooking of all kinds of food regardless of texture. These options keep the pressure level under control. Choosing 5, 10 or 15 PSI, cooking and canning are safe and eased. Capacity: Its high capacity 16 quarts and 22 quarts, guarantees quick cooking and canning of large amounts of food. With using additional racks, Mirro cooker and canner provides sufficient space for 30 half pint jars or 16 pint jars. It is designed to decrease cooking time and heat source. Fast Cooking: In today’s very busy and active lifestyle that a lot of people live, cutting back the cooking time is essential. While keeping all nutrients from the food, Mirro pressure cooker is a great help in preparing meals. It can cut back the cooking time up to 70% comparing to other water bath canners and other traditional appliances. User-Friendly: Mirrro has created and developed a very user-friendly cooker/canner with numerous safety options. These features include locking handle, overpressure release valve and gasket release window. The ergonomic handle has safety locking option which prevents lid opening when the cooker is under pressure. The valve is installed for releasing the overpressure. Both lid and pot are sealed with a rubber gasket for hermetic sealing within the cooker. When there is an overpressure, the gasket allows excess steam to release. 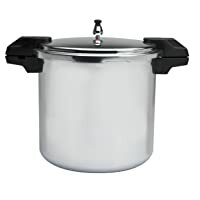 Limited Use: Unfortunately, Mirro Polished Aluminum Pressure Cooker/Canner are made of aluminium so they are not recommended for use on glass top or flat ranges. They cannot be used on glass, ceramic or induction tops of the stoves. These restrictions highly limit the use of this pressure cooker/canner. Size: Although, size and capacity are great advantages, this cooker/canner is very robust and heavy for cleaning and maintaining. The oversized cooker can be very heavy to lift or handle. The Mirro Polished Aluminum Pressure Cooker/Canner got the excellent customers reviews. The customers have highly rated this product for its capacity, pressure controlling system and safety features and all other advantages. Customers are also highlighting the perfect balance between price and value of the cooker. If you like Mirrow’s products, Mirro Polished Aluminum Pressure Cooker and Canner is a great choice for you, it’s good for its price. Despite some disadvantages and bad customers’ reviews, this Mirro pressure cooker/canner offers capacity, speed and reliability at a very affordable price. The customers love it for the highest level of security and its 16-quart/22-quart capacity that offers the time and energy savings. Buy Mirro Polished Aluminum Pressure Cooker on Amazon! !